Ride-on toys have been widely appreciated by even the youngest kids since decades. Not only do they allow the child to develop a sense of independence, but confidence, too. Every parent knows how hard it can be to keep their toddler occupied. Sometimes, no form of entertainment works. That leaves both the parents and family members at a loss as to what to do. Ride-on toys are a fantastic solution, since parents can keep their kids busy without having to pay as much attention. The child will ride around and the family members can focus on their own chores. These toys are also wonderful for both outdoor and indoor use, since they allow the child to ride virtually anywhere. After hours of research, we have managed to choose a variety of kids rideon toys of various ages. We compiled a set of both safe, affordable and entertaining products that will keep your child occupied. Thanks to our research, we reviewed all of these products to provide you with an honest opinion on each toy. This list includes all of the products that we have deemed worthy through our research. These ride-on toys will help keep your child entertained and busy. This will help them develop confidence and individuality when riding toys and in general, everyday life. For older children, the Razor Crazy Cart is a fantastic choice. Radio flyer has been keeping kids happy for over 100 years. Their red, toy wagon has been seen by almost everyone, especially since its popularity in the 1920s. Their products are basically the stuff of legends, and for generations kids have been kept satisfied with their ride-on toys. Their simplicity and striking beauty and easy-to-ride qualities make them very accessible. They’re also some of the safest ride-on toys out on the market; thanks to Radio Flyer’s ‘no junk’ policy. This means that the product is stripped down to its bare essentials: it’s made for riding. There are no accessories that will make riding toys for toddlers harder or less enjoyable. The Radio Flyer Scoot-About is the ideal toy to help your child discover the world. Kids who have used this ride-on discover a sense of adventure, independence and fun. No matter where you will be, you will be able to take this light-weight toy with you. This will help encourage your child to explore new surroundings, no matter where you are. This ride-on focuses on a simple, red design. The attractive, chrome bars help give the product a somewhat vintage feel. The ride-on itself is made from a sturdy, steel frame. This ride-on has been created with widely set-apart wheels to help encourage stability.This ensures that you will not have to worry about your child flipping over. The product is also easy to assemble, and it shouldn’t take more than 20 minutes to do so. For added fun, Radio-Flyer added a working ringing bell to their design. The ride-on also features a front bumper, that will keep your inside home safe from damage. The wheels are designed to allow your child to easily glide on almost every surface. The adjustable seat will also grow with your child, allowing them to keep their toy from 12 months-3 years. It has 3 adjustable heights available. This ride-on can take about 42lbs and is ideal for children between 1-3 years of age. The dimensions of the product itself are 23.54″ X 18.98″ X 17.64″. Thanks to the product itself weighing only 8 and a half pounds, you will be able to take it with you wherever you go. This will help your child explore various surroundings. Micro Mini, originally being a Swiss brand, has had their products distributed in USA for a long time now. Their innovative products have been supplying both adults and kids with personal transport products since 1999. The Micro-Mini ride-on can also transform into a stand-up scooter. Looking for an E-Scooter? Check out our review of the best electric scooters for kids. With nearly two decades on the market, Micro has perfected their products one by one. Their products for kids are made to be simple and effective thanks to their minimalist design. Their designs have won various awards worldwide, and it’s easy to see why kids flock to ride their products. Micro has modern, innovative designs that combine fun with quality and safety. It’s important for parents to keep their kids safe when scooting, and Micro Mini is the ideal product to help with that. This Swiss-quality ride-on is ideal for any parent that is looking for gift ideas to get their kid something new and interesting. Scooting around on the Micro Mini is easy, safe and entertaining, no matter if you are indoors or outdoors. If you want to get your kids outdoors but are struggling to do so, the Micro Mini is the best solution. The Micro Mini has a bulkier and sturdier design than our previously listed product. It also comes in 4 colors: blue, mint, pink and red. No matter how fussy your child may be with their colors, they will surely be satisfied with one of these! Thanks to the bigger design, the child will be able to mount the ride-on with confidence. This will also help improve the child’s balance. The two front wheels and one back wheel will allow your child to maneuver the Micro Mini, no matter where they are, with ease. The unique deck with the raise silicone grip allows your child to easily steer the Micro Mini around their chosen area. The anti-slip grip tape seat will also help keep your child in place when they ride, avoiding falling down and slips. One of the best features of the Micro Mini is the removable top that transforms the ride-on into a stand-up scooter. Another great feature is the toy drawer incorporated into the design. This toy drawer can slide in and out, allowing your child to hide their favorite toys within the ride-on. This ride-on is designed to suit kids from 1.5 years of age to about 5. Thanks to the adjustable options, your child will be able to learn, grow and explore with the Micro Mini for years to come. This will provide great memories for both the toddler and the parents alike! Micro-Mini’s ride-on weighs about 9 and a half pounds and has a removable handle, should you want to travel with it. Little Tikes has been on the market for nearly four decades now, and we have no doubt that you have already encountered their best-selling product previously. In 1991, the Little Tikes Cozy Coupe toy car for kids was the best-selling ride-on toy for kids. Since then, Little Tikes has increasing success with all of the lines of their toddler riding toys, including the Go and Grow Rollin’ Giraffe little tikes scoot around animal rideon. Their riding toys for toddlers are made to look appealing, and to be safe and cozy, too. The Rollin’ Giraffe is no exception. Having been introduced in the early 2000s, this ride-on has been tried, tested and loved by many kids around the world. If your child needs a ride-on to help strengthen their legs for walking, or to develop confidence and independence, the Rollin’ Giraffe Rideon is the perfect product to encourage that. It helps combine playing with learning, allowing your child to gain increasing strength and balance when moving. It’s an easy to assemble ride that will be enjoyed by many kids, no matter their skill-level and age range. Little Tike’s Giraffe Rideon design is by far one of the friendliest ones we’ve seen so far. The whole product is designed to be shaped like a giraffe, the wheels being the legs and the front, the head. If you need an engaging toy for your child, the yellow Rollin’ Giraffe is the perfect solution. The Rollin’ Giraffe Rideon is one of the safest riding toys for toddlers. Being made of plastic, the ride-on won’t be dangerous if the child happens to fall over. The light but sturdy frame allows for easy mobility, and the toy can be taken anywhere, thanks to is light-weight. The adjustable seat and happy face of the Rollin’ Giraffe will make any child want to ride it. The back wheel is significantly bigger than the two, smaller front wheels, to increase stability. The widely set front wheels also help in stability thanks to them being set wide apart. The ride-on is perfect for indoor and outdoor rides. This ride-on is ideal for kids between the ages of 12 months to 3 years. The Rollin’ Giraffe can take up to 50lbs and weighs about 2 pounds, which makes it a perfect travel companion. The Step2 ride-on push car is the ideal toy for both girls and boys alike.Step2’s goal has been to produce ride-on toddler toys, and toys in general, for kids to encourage creative play. Their toddler riding toys spanning in use from toddler-oriented ride on’s to school year, educational learning sets. The Whisper Ride is the ideal solution for any child that likes to play in a cozy and safe environment. Thanks to the push-quality, parents can replace strollers with this stylish ride on car during warm, summer days. It will help the child to explore their surroundings with different mediums, and the parent can watch over the ride at all times if necessary. Thanks to all of the features included within this design, the child can be directed by a parent in their younger years. As they develop confidence, the child can take a chance at riding toys for toddlers on their own. This is a great way to help the child gain individuality over the years. As they grow, the car will grow with them for a few years. During travels, the handle can be tucked in under the car, too, to help in transportation. The Whisper Ride is one of the best designs we’ve seen on the market yet. It’s a great, original design that takes the shape of a small car, available in both pink and blue. If your child likes cars or likes riding around in them, the ride-on will be a dream ride! Thanks to the handle, included to help push and navigate the child, this is one of the safest ride-ons out there. It gives the parent full control of the vehicle, and is a great stroller-alternative. If you want to go to the park or run down to the store, you can take out the Whisper Ride and take your toddler with you. This ride-on has a tuck-in, tuck-out handle that is very convenient for traveling purposes. If you are going on holiday or to visit family and friends, you can take your child’s toy right along with you. This is great for exploring new surroundings with a toy your child is already familiar with. The Whisper-Ride is ideal for kids between 12months and 4 years of age. This makes it a very versatile product that can keep growing with your child. The item weight is about 17 pounds and the dimensions are as follows: 45.5 x 19 x 34 inches. The Pewi ride-on bike is a parent long-time favorite. Pewi’s goal has been to make a riding toys for toddlers that can help them develop. Needless to say, they did a phenomenal job with the product they came up with. If you have a young child that is still learning to walk, the Pewi Ybike is the best toy you could get for a toddler. Not only can you sit and slide on it in virtually every direction, but it can be used as a crutch too, to help the child walk. Having so many useful function, it’s easy to see why it has been a parent-favorite ever since the moment it hit the shelves. The Ybike will help your child stand up with support, and in time stand unaided at all. Pewi is known for helping kids develop balance, coordination, postural control and space awareness. In short, the most vital skills that come with walking. With the Ybike, your child will learn to walk, push and pull things and move alone around impressive distances. Looking for a balance bike? Check out this top balance bikes for toddlers review. Thanks to the child-friendly design, kids hop onto this riding toy without hesitation. The simple, spider-like wireframe doesn’t take up a lot of space, and the product comes in three colors: blue, pink and red. The front-grip support helps the child have stability, and the wide and long seat helps them sit comfortably. Thanks to the 360 degree turning function, wherever your child turns, the ride-on will follow them. The durable, aluminum frame is sturdy and won’t break easily. The plastic seat is molded in a way to provide the ultimate comfort for each and every toddler. As your child grows, the Ybike support will turn into a ride-on to help your child develop vital skills essential to walking. The Y bike is ideal for kids between 12 and 36 months of age. It will develop right along with your child, transforming from a walking accessory to a ride-on. The Ybike weighs about 5 pounds, the dimensions being: 20 x 17 x 18 inches. Fisher Price is one of the most famous toy-brands out on the market today. They have been creating quality toddler toys for kids of all ages for over 80 years now. Each product they make is of high-quality and engages the vast majority of children. The Little People Music Parade ride-on is no exception! If your child is easily bored with the typical ride-ons, then Fisher Price might just help. Their Music Parade ride-on is a fantastic way to keep your child entertained and occupied all the way through their ride. If your kids like to have things to press and features to explore within their toys, then the buttons and musical instrument sounds provided here might just be a fantastic solution. The car is designed to be stimulating both creativity and learning wise. All of the sounds included with this ride-on are friendly and should encourage the child to mount the car and ride. All of the buttons on this ride-on correspond to the sounds they make, and there are plenty of places to hide toys within the toy. If your child likes to have toys that are engaging and entertaining, then Fisher Price will give them just that and more. The friendly and colorful design of this car-like ride-on attracts the attention of even the youngest of children. It looks great and has plenty of visible, engaging features that the child will quickly turn to explore. The Fisher Price ride-on is one of the safest toys out there. The wheels don’t lift too high off the ground, and there are two wheels on each side of the toy. This helps the child remain sturdily on the floor, encouraging good balance. The best features of the Music Parade include all of the music-buttons that the child can press. There is a trumpet, five buttons on the front of the car and three on the inside. All of this is surrounded by a pressable drum, levers and other buttons. One thing is sure: your child won’t be bored with this ride-on! The Musical Parade is ideal for kids between 12 months and 3 years. This ride-on weighs about 5 pounds and the dimensions are about 20.8 x 10 x 15.5 inches. It’s easy to see why we are including Little Tikes on our list again. Their toys have exceptionally unique designs that are different from the status quo. If you are looking for a ride-on toy for you little girl specifically, then this horse carriage will make greatgift ideas. It’s one of Little Tike’s more original toys, and parents keep praising it for the originality. It’s the ideal present and has been an Amazon’s Choice product for a long time. It’s great if you want to supervise your child as they ride. You will be able to fully control where your child moves, especially thanks to the handle that helps you maneuver the ride. There will be an hour or two long assembly required when purchasing this product, since there are many features you will need to put together. From the handle, to the carriage, to the horse. This, however, still doesn’t stop many parents from purchasing this ride-on. It’s simply a great toy for any child that is looking to jump into the princess-role. If your child is tired of the typical, seemingly boring toys, then this carriage will provide many hours of fun for your little one! Little Tikes surprised the market once again with their original ride-on design. The pink carriage has a white horse attached at the front, which is a great feature to include. The carriage itself is covered in pink and purple paint, which is ideal for any princess-loving little one. The carriage is fully safe and provides lots of space to maneuver around. All of the four wheels are placed sturdily on the floor, and the horse doesn’t overpower the weight at the front. This simple-ride on’s key feature is the beautiful, white horse attached on the front of the carriage. The top of the carriage itself has a crown, where you can put belongings like a phone or toys. The bank trunk of the carriage also has space where your child can put in toys and belongings. This ride-on is ideal for kids between the ages of 18 months and 5 years. It’s a toy that will stay with them for a long time! The carriage weighs around 11 pounds and its dimensions are around 20 x 43.5 x 37.8 inches. Fisher Price doesn’t cease to surprise with their unique approach to educating children. As they provide an opportunity for kids to learn, they also provide lots of fun and entertainment. If you have been having trouble keeping your child occupied, the Laugh & Learn smart stages scooter should solve all of your problems. It’s a very effective ride-on that will help your child develop motor skills. Not only that, it will also help your child use their problem-solving skills when playing with the buttons on the inside of the toy. As the baby grows, it will understand more of the buttons available for play. This makes the Laugh & Learn ride-on a fantastic toy if you want it to grow with your child. No matter what stage your baby is at, there are three learning stages, each one fitting a certain age range. With all of the learning opportunities provided with this ride-on, it’s easy to see why so many parents gravitate to buying it. It encourages the child in a positive way to learn, have fun and keep trying! Fisher Price is known for creating very child-friendly designs. This ride-on in particular has a soothing, red color and is shaped like a kick scooter. The front of the kick scooter light also has a friendly, painted face. This Fisher Price ride-on is one of the safest out there. It has all of the four wheels steadily on the ground and supports the full weight of your toddler. If your child can stand but can’t walk, this ride-on will be ideal. It will help your child feel mobile, even with its current limitations. The ride-on has various learning buttons, including ABC’s, colors, numbers, shapes and many phrases in general. If you are looking for your child to expand, this is the best option. As your baby will ride along, it will be rewarded and encouraged with positive phrases to carry on. Thanks to the different stages of play, this ride-on will encourage development through all of the child’s toddler year. The FisherPrice Laugh & Learn is great for kids between the ages of 12 months to 3 years. This ride-on weighs about 5 pounds and measures around 22.5 x 10.1 x 13 inches. + Teaches ABC’s, numbers etc. Colortree’s ride-on is yet another product that seems to have a very unique approach design-wise. It’s a great toy for any child that likes excavators or is interested in construction-site toys. If you want to encourage your child to develop their interests, or to just provide good play, then this ride-on is ideal. The Excavataor has been loved by many parents with enthusiastic kids. Thanks to all of the various functions provided by Colortree with this product, your child will be able to ride and develop. It’s a great source of fun for both boys and girls, and even attracts the attention of older children due to the interesting structure. If you are looking for a unique product that won’t have your child be bored within minutes, then the Excavator is the choice. Not only does it look attractive and inviting, but it sparks the child’s curiosity from the get-go. The bright colors and maneuverability of the neck of the excavator will be able to provide hours of fun. One of the best features of Colortree’s Excavator is the fact that it can be used effectively both inside and outside house borders. It’s a fantastic ride-on for sunny days, especially around places where the child can use the dig function to its fullest potential. This ride-on is designed to mirror the image of an excavator. This, of course, means that not only does it have conjoined wheels, but a digger crane too. It’s an exciting design that will attract the attention of even the fussiest of kids. Thanks to the sturdy sit and well-balanced construction, this toy is very safe for all toddlers. The seat is easily accessible and the six connected wheels allow for a very sturdy and safe round. No matter if you are on the carpet, inside or outside, your child will be able to fully enjoy this toy with all-around safety. This ride-on will help develop your child’s balance and problem-solving skills as wall as their practical ability. Thanks to digger crane, your little one will also be able to fully endorse themselves in the play. It’s a feature many other ride-on construction-site toys rarely provide. This ride-on is ideal for kids above the age of 3, since it takes some already developed coordination skills to move the crane digger. The Excavator can take up to 66lbs of weight. The product itself weighs around 9 pounds and its dimensions are around 19.1 x 13.7 x 12.6 inches. Since the Mickey Mouse trend has been coming back, so has Minnie! Last but not least, we have one more, very original ride-on. This time, it’s a small ride on toy car decorated in a Minnie the Mouse design. If your child likes Minnie the mouse and has been engulfed in watching the Disney Channel shows, they will be perfect gift ideas. It’s a great source of fun thanks to all of the buttons and the easy slide and glide wheels. If you have been struggling to get your child to walk, then this ride-on will do the work for you. Thanks to the easily moving wheels, your child will be able to become mobile quickly. Even if your child can’t walk yet, all that is required to have fun with this toy is a bit of balance. Thanks to the back support on the back of the ride-on, your child will also be able to learn to walk. The back support is easy to grab and your child will be able to scoot along as they learn to walk, step-by-step. This ride-on is a great toy to help encourage many “first-time” experiences for your child. All of the sounds, lights and stickers will help keep the child engaged for many hours when riding this little toy! Kiddieland’s ride-on is based on a Minnie the Mouse theme. It’s covered in mostly pink, purple and white colors and has plenty of Minnie stickers all around. If your child loves this Disney the character, there is no doubt they will love this little ride-on too! It looks friendly and inviting to any curious child. This ride-on has a very safe base, and being on four wheels, it’s one of the sturdiest products we’ve listed so far. As long as the child has a basic grasp of how to sit up straight and balance enough to hold posture, this toy should be a great experience all-around. The Minnie-Mouse ride-on is filled with both fun and educational features. It has glowing lights, makes various sounds, pictures, a beeping horn, engine sounds, turning steering wheel gear shift, ignition key and a moving clock face. With all of these features, one this is sure, your toddler won’t get bored very quickly! Kiddieland’s Minnie-Mouse toy is ideal for kids aged between 12months and 36 months. Buying a toy for your child can be a challenge. Merely a decade ago, simple ride-on toys were extremely popular. Nowadays, as the developing world is surrounded by the internet, kids need to have toys that help keep them fully occupied. A simple-ride on will probably not do the trick, and that’s why it’s important to choose a toy for your child that will keep them engaged. There are a few features that we think each ride on should include, and it’s important to consider them before making your final decision. This process will help you make a calculated decision on what toy is best suited for your child. While some children may be happy with a simple ride-on, other kids will want to have buttons to press or music playing when they ride. Each ride-on will have a different, unique design. We recommend taking a look at your child’s toy collection, deciding what they play with and what they don’t play with. Which features interest them? Do they prefer to press musical buttons, or more logic-based buttons? Which colors grab their attention the most? Which shows do they watch the most? Some ride-ons come unassembled on purpose, so that you can put it together with your little one. This gives a sense of achievement for the child, and makes them value the toy more. Most of the ride-ons are very easy to put together, and it shouldn’t take more than half an hour to do so. There is a ride-on for every situation and every child. From Mickey and Minnie Mouse based toys, to excavators, diggers and horse carriages. No matter what your child is interested it, there is a toy that will fit the bill. We also recommend paying attention to the craftsmanship of the product itself. Some children prefer tricycle based ride-on toys, while others prefer more sturdy, four-wheel based ride-ons. There are plenty of designs available out on the market today. From the bulky, sturdy Micro Mini to the very maneuverable Ybike from Pewi. Both are wonderful products, but differ vastly from each other. It all comes down to experimenting and getting to know which design your child gravitates to more. Some ride-ons are safer than others. Depending on the posture, size and weight of your child, different ride ons will suit different children. Some kids prefer slimmer, faster toys while others prefer the stability of sturdy, bulky toys. It’s all a matter of preference, but the trick is to choose a toy that fits your child both size and weight-wise. It’s also good to check if the toy can be used both outdoors and indoors, since some materials may not withstand the hard gravel or cement roads outside. As we mentioned before, each ride-on toy is different. Some are meant to encourage simple motor skills, like balance, problem solving, practicality and good posture. Others, are meant to teach your child to walk, to scoot, or to learn their ABC’s and numbers. If you want your child to develop simple walking and scoot activity skills, then it’s recommended to buy a simple ride-on without all of the additional features. This will help the child to focus on strengthening their legs to help them walk later on. Many of these ride-ons also have different seat adjustment options, which helps the child grow with the toy over the years. If your child is easily bored, or just needs additional features to keep them busy, then there are special ride-ons for them too. There are plenty of education-oriented ride-ons that will help your child learn to talk, count, sing etc. For example, the Fisher-Price Learn & Laugh ride-on includes many buttons that encourage the child as they ride. On the other hand, the Minnie Mouse ride-on, that is also listed within our review list, has a movable clock face to help the child learn how to read time. There are plenty of ride-ons that will help your child develop as they ride! Toddler ride-ons usually have an age range between 12 months and 3 years, sometimes even up to 5 years. It’s very important to pay attention to your child’s age and the age range the ride-on is dedicated to. This will help ensure your child gets a toy that is sized for their needs. There are plenty of negative reviews online that say the ride-on in question will ‘clip’ the child’s heels or toes. The problem is the child being the wrong size for the ride-on, too small, too big, too light or too heavy. That’s why we included dimensions and weight limits in our review sections. This will help you choose the ideal ride-on for your child especially. We recommend going to a local toy store and trying out the ride-on in question, if it’s possible. This helps the child see if they feel comfortable, and which ride-on suits them most. When the choice is made, and the general dimensions are measure, then online shopping becomes increasingly easier and much cheaper. Usually, this makes shopping much easier and helps you buy a toy that suits your child perfectly. The Giantex Kids Ride is ideal for both girls and boys alike. If you are keen to have a ride-on toy that will be versatile and able to engage all of your kids, this is the one. The stylish design and durable craftsmanship allow this ride-on to be used both inside and outside the house. It can go forwards, backwards, turn right, left, and has working LED lights. There are different modes of speeds, which makes this ride-on ideal for kids over the ages of 3. If you are tired of taking out your stroller each time you’re going for a walk or to the grocery store, then we might have a good solution. Push Ride On toys are great fun both for parents and kids. They allow the parent to avoid fiddling with huge strollers, and they help make the trip more fun for the child. One of our favorite push ride on toys for toddlers is Radio Flyer’s All-Terrain Stroll n’ Trike. It allows the parent to have full control over the ride, and also allows the child to pedal and take over. It’s a great, versatile ride on that will help the child feel independent even during their youngest years. The ride on also has a small cover over the head of the child to help reduce rain or sun beams if necessary. The ride on also has a 4-in-1 feature, which helps the product grow with the child. It has four stages from 9 months to 5 years, ensuring all-around development. Finding safe toys for kids aged around 3 years can be difficult. Some 3 year olds still need to work on balance and walking skills, and that’s why choosing suitable ride-on toys for them can be difficult. One of our favorites, in this category, is the 3 Wheel Chopper Trike Motorcycle by Lil’ Riders. It’s ideal for kids between 24 months and 4 years of age and can be ridden anywhere, both outside and indoors. There are significantly more ride-on toys for toddlers than for older children, but there are a couple of models that suit this category, too! Our favorite ride-on toy for boys aged 8+ is the EzyRoller drifter. When riding down hills and down the road, this drifter is like no other. You will be able to swerve, duck, pedal and regulate your speed as you like when you ride down your route. The product comes with assembly instructions and is very easy to put together. If your child needs some extra adrenaline and faster toys than their toddler siblings, the EzyRoller is a fantastic choice. Boys of this age may enjoy electric trikes, too. Many younger girls dream of having their own pony, and Smart Gear’s Ponycycle is a dream come true for many kids. It’s a self-powered horse ride-on toy that requires your child to move the pedals up and down, in turn moving the legs of the pony. This ride-on doesn’t require any pushing or batteries; it is fully man-powered which makes it a favorite among parents. It walks great in parks, suitable as indoor and outdoor toys and around the neighborhood. The wheels are sturdy and the faster the child pedals, the quicker the pony goes. It’s a fantastic source of fun for any little girl (or boy!) looking for adventure. There are plenty of pony designs available, from chocolate colored stallions to zebras and much more. Ride-on toys can be a wonderful source of entertainment for kids of all ages. No matter if your child just turned 1 year old, or if they’re already 8, there are plenty of ride-n toys to satisfy every child’s need. From Pony-Cycles that are ideal for boys and girls alike, a push toy that is perfect for a fun toddler ride. No matter how old your child is or what kind toys they like, they are hundreds of ride-ons available in every theme. Fro Mickey Mouse, to princesses to motorcycles. We recommend to take your child to a toy store and figure out which ride-ons are best suited for them. For example, when you already know the general dimensions and comfort level of what your child likes, it will be much easier to choose an online product. This will also ensure that you won’t be taking a gamble when buying a ride-on for your child! Taking your time to research and experiment before committing to a final purchase is vital, and can be a fun trip for your child too. It’s recommended to measure the height, weight and size of your child instead of focusing on online guidelines. Some children aged 3 are significantly taller than other kids the same age! To learn more about the interactivity of ride on toys read this study. Founded in 1917, Radio Flyer has been the most popular, ride-on producing company. Everyone surely remembers their red wagons that were extremely popular in the 1920s! Real lion roar and playful music! Previous articleShould I get a Skateboard or Longboard? 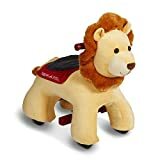 Next articleWhat to look for in Battery Powered Ride On Toys?